Germantown, Tennessee--September 10, 2018--Consider this your one-stop shop for fall production previews. Our Germantown students are hard at work in rehearsals beginning this week for their big annual fall theatrical productions. November 9-12, Friday, Saturday, and Monday at 7, Sunday at 2:30. At HHS, Shakespeare’s tale of love run amok is set in the 1950’s, accompanied by do-wop music, lots of action, and plenty of laughs. Theseus, Duke of Athens, is preparing for his wedding with Hippolyta, queen of the Amazons, when Egeus demands to be seen. She wants her daughter, Hermia to marry the man she’s chosen for her; Hermia wants to marry someone else. At the same time, the king and queen of the fairies aren’t speaking to each other, throwing nature out of whack, and a group of well-meaning but inexperienced tradesman are practicing a play for the Duke’s wedding. All these groups intermingle, make mistakes, until all is set right just in time for the wedding. 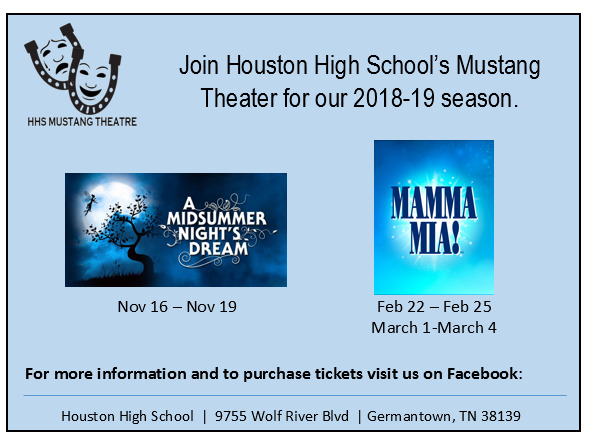 While our high school thespians are sharpening their Shakespearean sensibilities, students at Farmington Elementary, Dogwood Elementary and Houston Middle School are also hard at work on their fall production, Mulan Jr. With a cast about 65 strong, students from all three schools will perform the Disney classic under the Falcon Footlights moniker. See the cast list here. And, check out their very first dance rehearsal here—they are off to a great start! In case you were left wondering, Riverdale is taking a break from their fall show to welcome a new creative director, Christina Hernandez, to the team—and they will be back in the spring with the exciting, audience favorite Beauty and the Beast Jr.